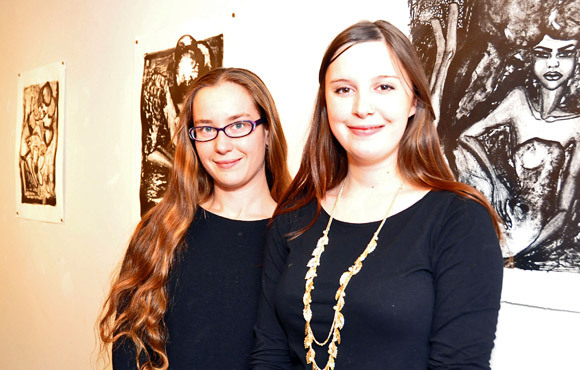 UBC students Lacia Vogel and Nicole Dowhaniuk, co-coordinators of Art on the Line. Art lovers should act quickly to obtain tickets to the ninth annual Art on the Line gala fundraiser. A very popular event that allows ticket-holders to select and take home a piece of original art, this year's gala is Saturday, January 29, in the Fipke Centre foyer at UBC's Okanagan campus. "This annual event has become a favourite for the community and campus alike," says Lacia Vogel, student coordinator and third-year Bachelor of Fine Arts (BFA) student. "We welcome anyone who is interested in art and culture or who wants to come out and enjoy a really fun and social evening of music, food and community building." At $175 each, one ticket admits up to two people and includes appetizers, live entertainment by The Malarkeys, and entitles the holder to one piece of original juried art. The works include a variety of visual mediums including drawing, painting, printmaking, photography, mixed media and more. Art on the Line will contain works by students, noted local artists, Visual Arts faculty, and alumni. Ticket holders will select the artworks based on a random lottery system. Although only 100 tickets are being sold this year, more than 125 works will be available to choose from, ensuring even the last ticket holder gets a choice from a large selection of juried artwork. Patrons who would like to watch the art selection and enjoy the evening of music and food can purchase a ticket for $10 at the door between 7 and 7:30 p.m.
Art on the Line is hosted by the Department of Creative Studies in the Faculty of Creative and Critical Studies and the Visual Arts Course Union. The event typically sells out quickly. Tickets are available by cash or cheque (payable to UBCSUO), weekdays from 9 a.m. to 4 p.m., in office FIN 162 until Dec. 23. For additional ticket information email irma.ronkkonen@ubc.ca. Doors open at 6 p.m. with the draw beginning at 7:30 p.m. Funds raised go towards the UBC Okanagan BFA Graduate Exhibition in April as well as to the Alternator Gallery and Arts Council of the Central Okanagan.